Old time pottery and other antiques from Asian Shipwrecks. To read more about the pottery history, archeology and related research, click on below pottery picture. Earthenware is the earliest type of pottery known to have existed for 10.000 years. Secondary clay was formed on the wheel or rolled into strings, laid on top of another to form the pot. Earthenware's were commonly fired in simple open pits and therefore found in most of our old civilizations. Firing temperature normally reached 400 to 700 degree Centigrade but some types are know to have been fired at higher temperatures. Decorations was often limited to cord marks, made by pressing a cord into the wet clay. Elaborate cord patterns was similar in many coutries and over wide areas and therefore difficult to assign to a specific place. Most of the earthenwares found on 14 - 16 th century shipwreck usually contains some remnants of food or other on board necessities. The limited number found suggst that earthenwares were never made for export. Long before the Chinese made blue and white porcelain using cobalt, a black iron oxide was used to paint motifs below a clear permanent glaze, thus protecting the decorations for long times. This technique, used at Cizhou in northern China, developed independently from the celadon production in southern China. By the 14th century, the underglaze technique appeared in Sukhothai and Sisatchanalai in Thailand, and in Vietnam. At Sukhothai, production continued until the end of the 16th century. Indigenous underglaze motifs included stylised flowers and fish. Fish, and the chrysanthemum representing long life and happiness, were preferred at Sukhothai and Sisatchanalai. In Vietnam, a flower motif was common. It is possible that the underglaze decoration technique (painting with oxides and then applying glaze) arrived in both Thailand and Vietnam with immigrating Chinese potters. The Turiang shipwreck (+/- 1370) is the first known case of similar Vietnamese and Thai underglaze decorated products being found together and clearly contemporary. Other underglaze decorated wares from Sukhothai were found on the Longquan, Xuande and Singtai shipwrecks. Underglaze painted ware of this period is rare. Collectors beware: modern Thailand produces many copies, often sold as genuine antiques. Celadon is a western word used originally to describe the green glaze of ceramics from Longquan in China. An ash glaze (made of clay mixed with wood ash), it requires 2-5% iron, and must be fired in a reduction atmosphere. A green glaze was in use in China by the 7th century, and during the Song dynasty (960-1280) this developed to a jade-like substance. Celadon, like jade, was believed to have magical and protective powers. It was said that celadon would ring if danger was approaching, and would change colour to warn of poisoned food. No wonder it became so popular. Celadon technique was arguably perfected by the 12th and 13th century, when it depended solely on balanced form. By the 14th century, motifs such as lotus flowers and stylised chrysanthemums were incised for decoration. From the early-14th century, blue-and-white porcelain was introduced, and gradually displaced the underglaze black tradition. Celadon production in Thailand seems to have started in the later part of the 14th century - around the time of the 'Ming ban' of 1371 when emperor Hongwu prohibited the Chinese from continued overseas trade. Many similarities support our contention that this was no coincidence, and that Chinese migrants were responsible. Chinese celadon was found on the Turiang and Longquan shipwrecks. Sisatchanalai celadon was recovered from the Nanyang, Longquan and Royal Nanhai shipwrecks. Yixing is a large pottery complex in Jiangsu province, China, that despite its old tradition is not not as well-known as other ceramic centers. One of the reasons for the limited awareness among antique lovers is its comparatively little exports. Tea lovers all over the world do however appreciate Yixing teapots and consider them the very best of teapots. These teapots are still made today although the 'old' granular clay, making the best of tea, is long ago exhausted. There are two distict differences between ordinary pottery and Yixing wares. The first is the type of clay used. The second: most wares are made by hand and not on a potters wheel. Yixing 'purple' clay is if fact a mixure of the purple soil, the green soil (from the mountains of Yixing) and the red soil. The purple clay arrives from around Lake Tai and the mixture of the three different types of minerals is still a safely guarded secret. Traditional Yixing teapot clay particles usually range from 0.2 to 0.3 mm in size. The porous nature of this clay is particularily suitable for teapots as the pot absorbs the flavour, smell, and color of the tea that is brewed in it. The repeated use of such teapot makes it better everytime. Many old Chinese people still carry with them their favorite teapot whenever they travel. Granular clay make it less suitable for forming on a potters wheel. Instead, the potter will flatten the clay by hand, cut to round and rectangular shapes and join them in a mould. After setting in the mould, the pot its individual shape by beating it into its desired shape. A traditional Yixing teapot it thus 'handmade' but formed in a mould. Other Yixing wares include garden pots, bowls and covered boxes. Some of them copying the famous Song-dynasty Jun ware. While the clay in these pots are not made from the famous purple clay, it is granular, porous and allows water to slowly penetrate. These pots too are made in moulds from a circular bottom piece joined with a flatt rectangular side piece. All Yixing teapots recovered from the Desaru shipwreck, tentatively dated to 1830, are marked in the base with the potters name. 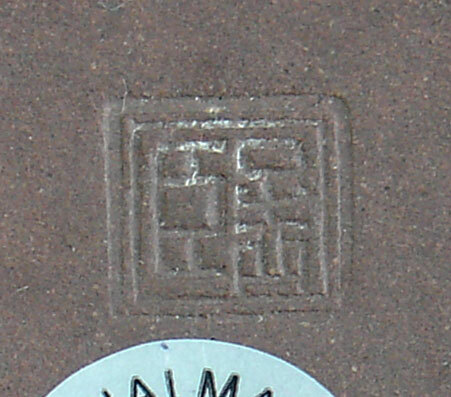 This mark will sometimes show the name of the factory and include a Chinese poem, most frequently associated with montains, spring water and the like. The marks shown below represents all the different markings on teapots from the Desaru shipwreck. Porcelain is the best known type of ceramics. Porcelain is sometimes referred to as 'blue and white' from its contrasting color or 'Underglaze blue' from its blue cobalt oxide below the glaze.The reason Chinese porcelain becomes so famous could probably be found in the Europeans and American's East India ships, trading with China from the 17th century. At that time, China had already exported blue and white porcelain to the Middle East and Southeast Asia for three centuries. Despite this great success in ceramic history, porcelain was not the reason the early European's were drawn to Asia. It was spices! The first Portuguese merchants to visit China eventually realized the value of the "white gold" and started importing limited quantities for the nobles of Europe. It was however first in 1603 that the Dutch East India Company (VOC) sent a load of porcelain to Amsterdam where it was sold for enormous profit. from that date onwards million of pieces of porcelain was exported to Europe. For more information about an early Portuguese shipwreck, please visit: The Wanli Shipwreck. Following that date Chinese blue and white porcelain become a much desired product in Europe and the United States which eventually interested antique collectors. China's earlier and traditional ceramics like the underglaze black decorated wares and celadon, is still today not that well-known. from the early 16th century. During the early part of the Yuan dynasty (1280-1368), potters at Jingdezhen, China, succeeded in decorating whitish local clay with blue cobalt oxide under a clear glaze, overcoming earlier technical difficulties relating to both the colours and the glaze. The date of this major event in ceramic history is much debated, but it is believed that it could have been as early as AD 1300. Production of blue-and-white ceramics developed rapidly during the Ming dynasty (1368-1644), greatly influenced by the imperial court and its stringent requirements. Although 'imperial' kilns in the Jingdezhen area also made export ware, those at Shantou (Swatow), Dehua and other parts of Fujian seems to have made wares primarily for the Southeast Asian markets. Following the death of emperor Wanli (1573-1619), unsettled dynastic politics eventually allowed Manchurians to conquer the country (the Qing dynasty, 1644-1912). Some of the most important imperial kilns at Jingdezhen closed, and were first reopened by emperor Kangxi only in 1663. The period between 1619 and 1663, when most imperial kilns were closed, is referred to as the 'transitional period'. It is believed that the imperial potters, temporarily without work, assisted the private kilns with the manufacture of blue-and-white ceramics. The sudden release from the strict guidelines of the court gave craftsmen the opportunity to express individual talents. A new spontaneity can be seen in the artistic freedom of the painting, the choice of motifs, and the quality of brilliant blue cobalt under a clear and smooth glaze. With the entry of European traders in China, the Chinese potters painted just about anything the "strange white people" wanted. Without any appreciation for Chinese tradition, the foreigners specified their own motifs and the European export porcelain appeared accordingly. With greater success in Europe and later in the USA, it accelerated the devolution of Chinese potting tradition. The exported porcelain was Chinese alright but only made by Chinese people and local clay. No tradition, no individualism and and long gone was the mythological motifs and the traditional floral designs the Chinese themselves had appreciated for centuries before. "The last ship to depart China with traditional Chinese motifs painted on porcelain was the (1625) Wanli shipwreck"
The Turiang ship (1370) that was loaded with Chinese celadon and Thai underglaze black wares, sank more than a century before Christopher Columbus found the 'New World'. When the Swedish East India Man "Gotheborg" sailed to China in 1745 to buy what is antiques today, she sailed right over the Royal Nanhai (1460) shipwreck that, already then had three century old celadons onboard! To view genuine old time pottery and other antique shipwreck ceramics, please visit our Artifacts for Sale Pages. For a more complete desciption of porcelain production at Jingdezhen, refer to the updated "Jingdezhen" section on the Wanli Shipwreck Site. As such we have precisely located a kiln sites in Sisatchanalai, northern Thailand in which our Royal Nanhai and the Nanyang shipwreck celadon ware was made around AD. 1380-1460. (See videos on: http://www.ming-wrecks.com/photopage.html ) Other kilns was located in Sukhothai where production wasters matched the fish and flower plates found on the Turiang and the Longquan shipwreck. These unique underglaze decorated wares was made at those exact kilns 600 years earlier! Our latest shipwreck cargo; The Wanli Shipwreck, of Chinese blue and white porcelain, was likewise pinpointed to the Guangyinge kiln site in Jingdezhen, China. The artifacts sold on this website are therefore legally and properly excavated and can be supplied with an export permit from the Department of Museum in Malaysia should this be required. This unique working arrangement makes us one of the few Internet sellers that sell from own excavation and issues a meaningful Certificate of Authenticity with all artifacts with a serial number.